One of the first kombucha brewers in Portland, Eva’s Herbucha has been producing delicious, raw kombucha for over 10 years. Herbucha is a premium raw kombucha drink with a twist. Drawing from the natural healing properties found in green teas, black teas, and hand-selected herbs, Herbucha is a natural drink with an alluring floral taste and crisp finish. More than a healthy tonic, Herbucha is distinctly delicious as well. 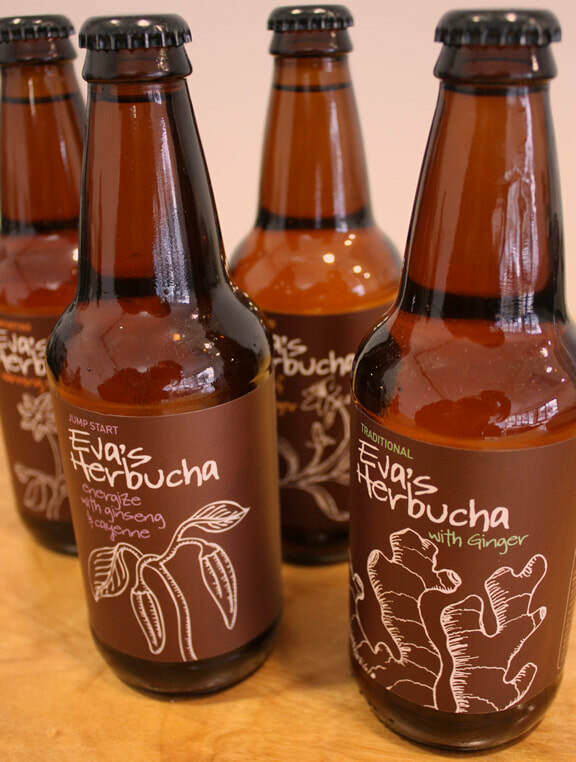 Check out Eva’s Herbucha flavors including her two most popular brews: Detox and Goddess Blend. Herbucha is brewed with organic, fair trade sugar and bottled in recycled glass. Take Herbucha on hiking trails, to backyard BBQ’s, or enjoy after a yoga class. And know that with every bottle you drink you support non-profit organizations working to protect our mother earth. As a proud member of 1% for the Planet, we donate 1% of our annual sales to help protect the environment. 1% for the Planet certifies our giving. And please make sure to try our new product - kombucha candy! As always, your feedback is welcomed and encouraged. Thank you for supporting Eva’s Herbucha. Zum Wohl (To your health)! WE INVITE YOU TO TAKE A SIP AND EXPERIENCE INNER GOODNESS. Eva Sippl is a licensed natural health practitioner (“Heilpraktiker”, licensed in Germany), a polarity therapist, and reiki master. To learn more about Eva and her journey of becoming one of the original kombucha brewers in Portland, OR, click on the button below.